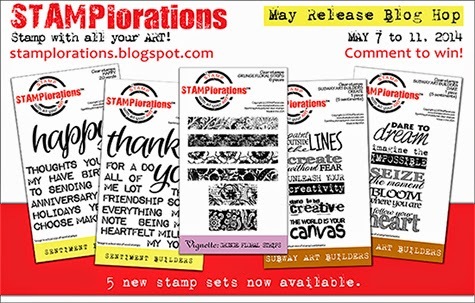 So glad you can join us in the STAMPlorations Stamp Release Blog Hop! The other STAMPlorations girls and I are sharing projects we've created that feature the 5 sets released this month. Visit all the stops on the hop and leave a comment for a chance to win 1 of the new stamp sets! For my card I've used sentiments from the Thanks Sentiment Builder Set and the four narrow strips from Vignette: Grunge Floral Strips. Oh I love those grunge floral strips! Beautiful cas. The grunge strips look fab! Wonderful CAS and very effective with the strips! You know I love all your cards, Shirley, even more so when they're one layers! Never thought to use the strips the way you did in this card -- you just keep coming up with fun ways to use stamps! Colorful and a great way to say thanks to someone. I love sentiment based cards - this is great. A really great use of sentiments. Love the colours. What a delightful card to showcase the new release! Unique, fresh, fun...I feel a 'shopping' coming on!! Love the floral strips with the stamped words! Fun card! I love the way you have used the different colour combination. Great way to show these stamps. What a super card... so simple but so very effective and easy to put together.. thanks for the inspiration.. Awesome!!!! Very fun card! I love the sort of random look and happy colors!